You need to start with a garage door opener. Program your garage, and then de-solder the micro-switch from the curcuit board and install two long length wires instead. You have to use a relay that will be activated by the horn (+) wire because, in my case, the garage opener only runs off of 3 volts. Here are some pics and explanations. The relay is in the left fairing ahead of the regulator. Gotta try this sometime when I get bored. Where would I find the relay I need? Excellent and simple idea to achieve. I did something similar, however, I wired mine into the turn signal cancel button which is actually a ground. I jumped the terminals in the opener with a wire so any time there was power it was transmitting. Then removed the battery, and soldered leads into the battery compartment. i then hooked the positive lead to a switched power source meaning its only hot when the key is on. Now when you press the cancel switch the opener is active because it completes the - side of the circuit. Mind you this only works if the opener has a 12v battery otherwise you need a voltage regulating circuit...which can be done simply with an IC. You can get a relay from most any auto parts stores. You will usually find them with the fog lights and off road lights. It is just a simple, normally open relay. How doI take the 12v power down to 3v? There is no conversion. If you look at the relay in the crappy schematic I drew, the 12v only passes through the windings at the top where the horn splices in. The 3v passes through the bottom through the switch contacts. 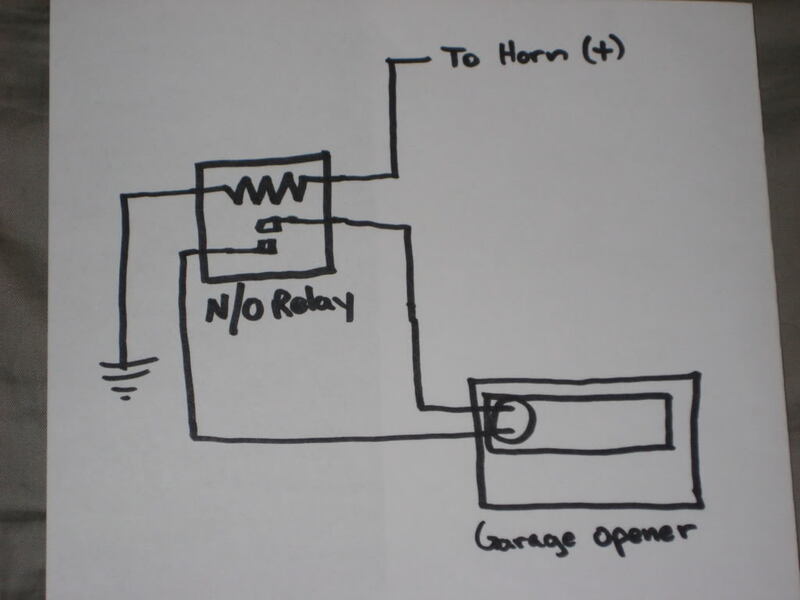 Not all garage door openers are 3 volts, many are more, but this is why I used a relay. To put it in simple terms, a relay is justan electrical switch. Hey I just done this modification. I have a genie garage door opener and its remote is key chain sized. Itaped it and the relay together in aneat little package, itfit perfectly up inside the speedo bracket which is only a couple inches from the horn on my 07 1K RR. I simply took the2 wires from the relay, put a double connector on the ends, plugged it into the horn and then plugged the horn wiresonto the extra tabs and its totally hidden, looks factory. 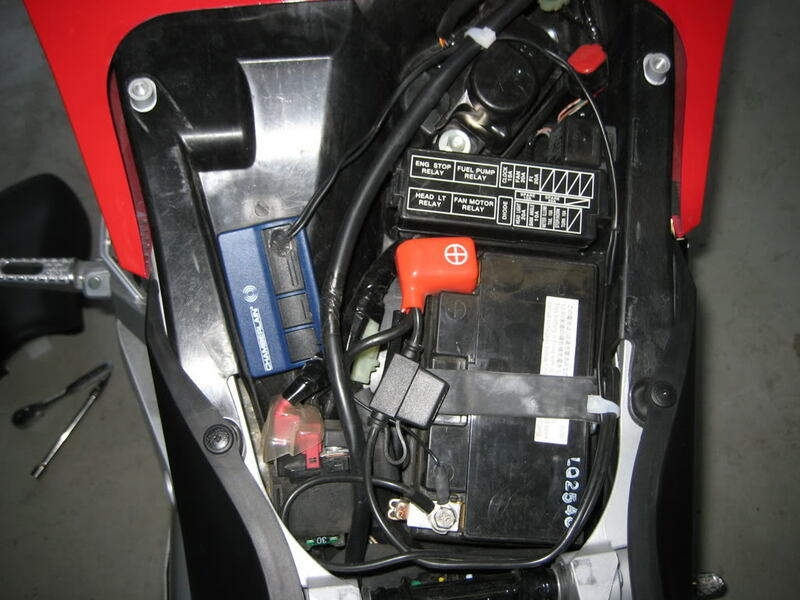 Nothing is spliced into, the bike is not modified in any way. It works great and if I dont want to hear the horn, I just pull one wire from the horn, the relay connection is still made up since it has the double connector and then the horn button only opens the door...no sound...... Love it...thanks for the idea! Garage door opener key fob. $30 bucks at Lowe's. Programmed one button for my house, another for my ex-roommate's house.